In recent years, there has been an increased interest in providing health insurance to poor and vulnerable populations as a means of increasing access to quality healthcare and protecting families from the substantial costs and subsequent income shocks. This evaluation measured the determinants of insurance enrollment as well as the impacts of having insurance for informal sector workers by randomly varying the costs and convenience of signing up for a government health insurance program available to formal and informal sector workers in Nicaragua. Overall, take-up of the insurance and retention rates were low, and enrolling in the program did not provide an absolute cost savings for participants. In recent years, there has been an increased interest in providing health insurance to poor and vulnerable populations throughout the world as a means of increasing access to quality healthcare and protecting families from the substantial costs and subsequent income shocks. Despite this recent interest, however, there is little rigorous evidence to date on the impact of insurance on healthcare utilization, expenditures, and health status among the poor. There is also a dearth of evidence on the optimal design of health insurance schemes to best target this subset of the population. Microfinance institutions (MFIs), as they are already well established among the poor, are often considered to be a promising means of delivering health insurance to poor families. In Nicaragua, many individuals working in the informal sector, the self-employed, and the unemployed are only eligible for care at a handful of Ministry of Health (MINSA) facilities, which are under-resourced and lack the infrastructure, staff, and medications needed to respond adequately to the population's health needs. As a result, workers report that they tended to avoid MINSA facilities and instead preferred to pay private doctors or avoid care altogether, incurring the risk of more extensive (and expensive) procedures down the line. In particular, poor individuals living in rural areas, the indigenous population, and individuals living in households engaged in agriculture suffer from below-average access to healthcare information and services. Lack of risk mitigation mechanisms such as insurance and social security (only 6.3 percent of the population contributes to social security1) is one reason why Nicaraguans spend a significant share of their income on healthcare, especially to buy medications and other non-consultation items such as medical tests. In January 2007, the government of Nicaragua initiated a pilot program that extended the Nicaraguan Social Security Institute's (INSS's) health insurance program, which was previously only for formal sector employees, to informal sector workers. The coverage and cost of the program were designed to be as similar as possible to those associated with the program for workers employed in the formal sector. For a flat monthly fee, individuals in the informal sector gained access to a wide range of services with zero copayment. The cost of the program was structured such that the monthly fee was higher in the first two months, at approximately US$18 per month, and then fell to approximately US$15 per month in subsequent months. The health insurance covered enrolled individuals and dependents under the age of twelve. This evaluation attempted to measure the determinants of insurance enrollment as well as the impacts of having insurance for informal sector workers by randomly varying the costs and convenience of signing up for INSS health insurance. Individuals were assigned to purchase the insurance at either the INSS central office or the branch office of three participating MFIs: ACODEP, Banco ProCredit, and Findesa. 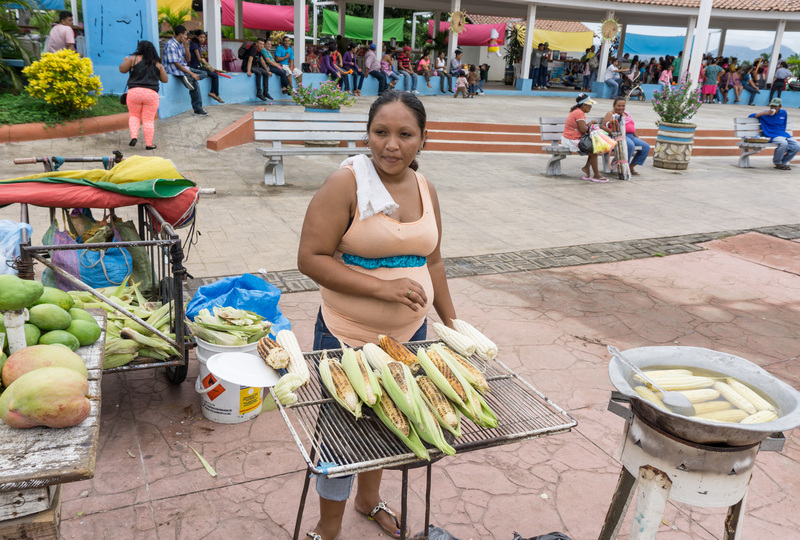 Between March and June 2007, a few months after the INSS insurance program was rolled out to informal sector workers, a baseline survey was administered to a representative sample of vendors in the three largest open-air markets in central Managua. At the end of the baseline survey, respondents were invited to choose a lottery ticket out of a stack of unmarked, pre-sealed envelopes. The possible lottery prizes included a blank ticket (no prize); an INSS brochure detailing the insurance product; a brochure accompanied by a 6-month insurance subsidy with instructions to sign up at the INSS office; or a brochure accompanied by a 6-month insurance subsidy with instructions to sign up at an MFI office. The 6-month subsidy was worth approximately US$96 and was provided in the form of a voucher; respondents were told that payments would be made on their behalf directly to the INSS. After one year, respondents were then approached for a follow-up survey to measure changes in health and healthcare utilization. Take-up of insurance: Overall, 20.3 percent of the sample enrolled in the insurance scheme. Those receiving the informational brochure alone were approximately five percentage points less likely to enroll in the insurance program relative to the control group, who received nothing. This potentially indicates that expectations about the product were overly optimistic, which is consistent with the fact that all those in the control group who enrolled dropped out of the program by the second year. Those receiving a 6-month subsidy and assigned to register at the INSS office were 33 percentage points more likely to purchase insurance than the control group, while those receiving a 6-month subsidy and assigned to register at a participating MFI were 28 percentage points more likely to enroll relative to the controls. Focus group discussions suggest that many respondents did not understand the purpose of the MFI serving as the delivery agent and preferred to enroll directly at the INSS. There were also some reports of coordination problems between central MFI management and MFI branches about the enrollment process. Impact on utilization and expenditures: Overall, enrolling in health insurance did not lead to an increase in the probability of seeking healthcare from a provider, but it did cause a shift away from public and private facilities into facilities covered by the insurance. Health expenditure patterns mirror the changes in utilization patterns. Enrolling in health insurance led to a 55 percent decline in total out-of-pocket expenditures for respondents, although this is not statistically significant. However, the out-of-pocket savings were lower than the unsubsidized insurance premiums. Hence, insurance did not provide an absolute cost savings for the average individual. Retention: Consistent with the absence of a perceived benefit to health insurance among those on the margin of enrolling, retention rates in the program were very low after the expiration of the subsidy. At the follow-up survey, less than 10 percent of those who had enrolled in the previous year were still paying for insurance. Thronton, Rebecca L., Laurel E. Hatt, Erica M. Field, Mursaleena Islam, Freddy Solis Diaz, and Martha Azucena Gonzalez. 2010. "Social Security Health Insurance for the Informal Sector in Nicaragua: A Randomized Evaluation." Health Economics 19: 181-206. 1 International Insulin Foundation (IIF), "Nicaragua RAPIA Report"